Earlier this year my good friend Jocilyn Wagner contributed a review of Hiroki Ugawa’s Shrine of the Morning Mist, Volume 1 to Experiments in Manga. She was recently inspired to do so more manga blogging and to write another review, and so I’m happy to welcome Jocilyn back to Experiments in Manga! 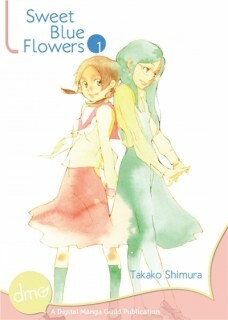 This time she’ll be taking a look at the Digital Manga Guild edition of Sweet Blue Flowers, Volume 1 by Takako Shimura. 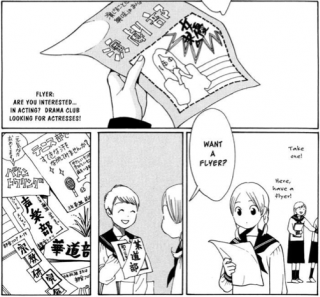 Easily Shimura Takako’s most well-known manga endeavour, Sweet Blue Flowers is an unforgettable bildungsroman of the classic Japanese girl’s school (minus the dorm boarding). The story focuses on two heroines: Manjoume Fumi and Okudaira Akira. Childhood friends who were separated for elementary and junior high and by coincidence have moved into the same neighborhood together for high school. The girls, who don’t at first recognize each other, are reintroduced when Akira (called “Aki” in this version) saves the timid Fumi from train molestation. Although the two attend different schools, their close friendship and shared interest in acting cause Fumi to find excuses to attend theatre club at Aki’s much more wealthy/prestigious school. The biggest problem in my mind is that bizarrely, instead of how it’s always been rendered “Ah-chan” in both the original manga AND the anime near and dear by now to the hearts of North Americans, this version replaces all the Ah-chans with “Aki.” To be fair, Aki is more of a fleshed out name than Ah-chan, but it’s really a boy’s name and it doesn’t suit Akira’s character, besides which it’s not a name Shimura-sensei chose. Part of what makes Aoihana so cute is that the Okudaira siblings have their names reversed: that is to say, Akira is usually though not always a boy’s name and Shinobu is similarly a girl’s name occasionally used for boys. Perhaps the idea here with “Aki” was to emphasize that her name doesn’t fit the image? Yet I think Shimura-sensei would argue that’s exactly why she’s always been called Ah-chan (to make up for/ignore the more masculine Akira). Put simply, Akira is always called Ah-chan because she’s ridiculously cute and her role in the story is to be the best friend and onee-chan from Fumi’s childhood, thus someone you’d want to give a cute nickname to like “Ah-chan.” Perhaps because she’s given a bit more wisdom than other characters or because of her future role in the story, the DMG team chose to call her Aki. At any rate, it feels like an awkward and unnecessary change that will stick out painfully to most fans of the work. Additionally, there’s just too much left untranslated in terms of signage with parenthetical notes given instead that really detract from the flow of the reading. As far as I can tell, all the signs and documents are left untranslated (even ones that couldn’t possibly be hurt by replacement with English such as the heading card in the photo album scrapbook that reads “Christmas Party” or the words on the cake for Chizu’s party) which comes off looking like the typesetter just couldn’t be bothered/too inexperienced to handle the job. For the none-Japanese reader it’s too much work to constantly be hunting for marginalia. Shimura’s penmanship isn’t all that legible anyway (most were drawn with marker), so if you can read Japanese, leaving the signs as is doesn’t necessarily help things—except in the case of one of her school gateway engravings, it doesn’t exactly have a “Shoudo” quality. Perhaps the concept here is to give the English reader a sense that they’re really in Kamakura, but that’s actually doing Shimura-sensei a disservice as the gorgeous well-researched setting she’s drawn is more stark and striking than most mangaka can muster. Add to this a lot of really tiring typographical errors such as “Pap” for “Pat” and “Beautiful is Youth” “Hasegawwa” and “Fajisawa”, really detract from the reading experience. The emanga version of Sweet Blue Flowers is very welcome and we love you for it, but please consider further editing before sending it to the printer. In terms of the digital file, it’s definitely topknotch. Emanga allows you to choose from among seven or eight major formats as well as offering you the option of reading your books through their proprietary online reader. I was really happy to be able to get Sweet Blue Flowers in PDF since it looks and functions the best on the iPad. It’s not always the most annotation friendly, but since manga is an artistic medium it makes sense to use an Adobe format to access it. Unfortunately, once you’ve chosen to download the file in one format, you’re stuck with only that single file type and you’d need to repurchase it from emanga to get it in a different format (DRM is kinda evil like that). I had no trouble downloading the file and it opens great on all my devices. Given their many options for downloading, their pricing system that’s free from points and rentals and their interface with Amazon, I’d highly recommend emanga over some other digital manga sites I’ve tried (except when it comes to editing).